Thank you for being a subscriber to our newsletter. We encourage you to view all of the fixtures on our website whether they show as available or not. If you find a fixture that is out of stock that you would like to purchase, please let us know. Many times we can locate that fixture for you. Items marked "rare" are sometimes hard to come by, if you would like to purchase one, let us know and we will contact you as soon as we find one. Our website is mentioned in an article about Fans in the July issue of "This Old House" magazine. You may notice that our prices have been lowered by up to 10%! If you have been waiting for a deal on your favorite fixture, now is the time! These prices are available for a limited time only. We now have a new shopping cart! We have switched to a new secure shopping cart that is easier to use! We are now able to process credit card orders over the phone too. Please call us at (209) 744-8532 for personalized service. One of our favorites! 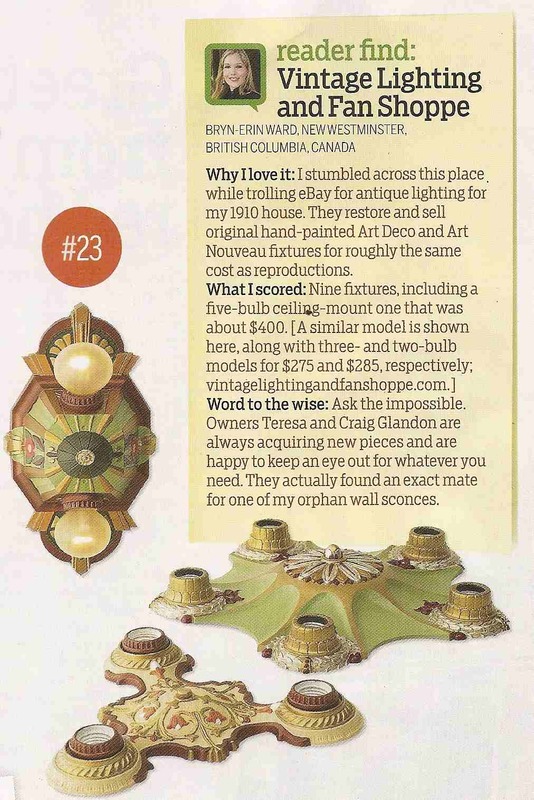 It is one of "This House House" magazines favorites too... this fixture was featured in their December 2009 issue! Click here to read the article. Another one of our personal favorites, this fixture has incredible detail and is so elegant. It really makes a statement, while fitting right in with many decors. Perfect for lower ceilings! Art Nouveau styling and simplicity are the hallmarks of this fixture. Perfect for smaller rooms. We also offer the period correct frosted reproduction bulbs that you see on our fixtures here. They are the finishing touch to any vintage fixture. They are not available in any retail store. Please click on the link below to see our recommendations as to the proper wattages for each application. The price on our bulbs are going to increase soon due to the rising costs for materials. Stock up now to save! As always, if you have any questions or experience problems on our website, please feel free to email or call us. We are available by phone Monday - Saturday 10am - 7pm PST at (209)744-8532 or (209) 810-9973. Please enter your email address below to unsubscribe to this newsletter.